"I feel alive and well, therefore I run. I run, therefore I feel alive and well." - Ron Hill, Britain's greatest marathoner, who is still going strong at the age of 70! The guy went sub-2:10 nearly 40 years ago and has run for 45 years straight. He even doubled everyday (but Sundays) for 26.2 years straight. On TV (Universal Sports) 9am And 6pm Eastern. MEB WILL SMASH ON RITZ IN LONDON! Why is Ritz the "lead" American at London when Meb is in the race? We wanted to keep the results off of our homepage in case people wanted to watch the online replay on-demand, but the video might not be up for a while. Martin Lel Pulls Out With Hip Injury His bid for an unprecendented 3rd straight title is over. Another Must Read: A Look At Martin Lel - The Man Was Born To Run Self-pity doesn't exist for this guy, who nearly refused to give up working at a grocery store to pursue life as a runner. *Steve Cram: Where Have The Good British Men Gone? LRC London Marathon Men's Preview Dave Bedford has done it again - assembled the top marathon field in the world. Boston may have gotten the press the last two weeks, but London is no doubt the top marathon in the world, which is appropriate as Britain is the land of the most famous monarchy in the world and thus it's fitting that London is without a doubt the King of the marathon. 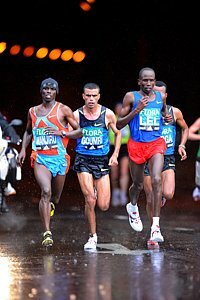 3-time champ Martin Lel vs. Olympic champ Sammy Wanjiru and a host of others, including stud Abderrahim Goumri and the debut of World XC champ Zersenay Tadese. The field is so loaded that Luke Kibet, the current World champ, is listed under our category, "Guys Who Can't Win," which also includes Americans Meb Keflezighi and Dathan Ritzenhein. On the boards: Why is Ritz the "lead" American at London when Meb is in the race? LRC London Marathon Women's Preview Irina Mikitenko emerged as a star last year at this race and she is back to take on the most credentialed marathoner in the world, Catherine Ndereba, and Ethiopians Geti Wami and Berhane Adere. Oh yeah, Olympic champ Constantina Dita is in the field. Plus, we even give you betting advice with our darkhorse Martha Komu. American Kate O'Neill is also in the field. *Alan Webb's 3:51 Mile Voted #1 Drake Relays Moment Meanwhile MJ and Gwen Torrence were voted the all-time Drake athletes. *Katie Flood Wins 3rd Straight Girls 3k Slowest winning time yet for the junior. *Who Will Be The Next Jesse Owens At This Year's Drake Relays? We hope no one, as we don't want WWIII. *IAAF: 3 World Leads Come From Meet As Sam Chelanga Gets Collegiate Record 27:28 & Collis Birmingham Gets Australian Record of 27:29!